I invite the place that I live to encompass me, wholeheartedly. It is a workplace for my development as an artist and critical thinker of the world we live in, especially the place we all call home. The environment and its workings are ever present in my work. I look at the world around me symbolically and present it as such in the work that I create. I observe connections between the plant, animal and human world that present concerns, desires and realities for many of us to consider or experience. Direction is an everyday activity, physically and psychologically. When things don’t go as they seem, we say, “we have lost our way”. This attempt at this immense subject is imbued with personal and cultural ideas. The walnut dyed cover looks like leather and feels like a field journal. The book is drum leafed. 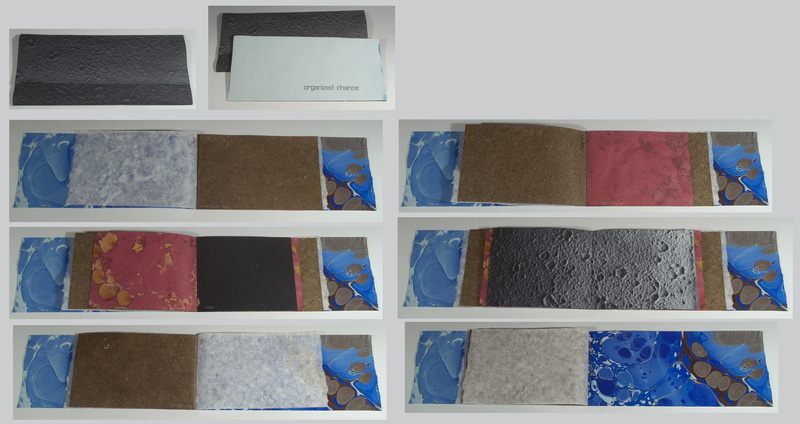 Each page is handmade paper with a pulp image applied to the wet sheet during the papermaking process. North -collograph, south -letterpress, east -intaglio & lino, west –lithography. Investigation of the natural world is a fascinating subject that I cannot resist. This succinct natural history of pollen grains and ovary pockets is an intimate relationship that keeps the world growing. All the paper in this book is handmade. The crunchy yellow is from corn, which is a type of grass. The blue is pigmented sisal another type of grass that is used for twine on bales of hay or straw. The thin, crispy, translucent sheet is abaca – a non-bearing banana plant in which the stem and leaf is utilized. The black sheets are pigmented cotton – some with white pulp applied to imply a cosmic sensibility. All the drawings were drawn on abaca as explained above. The covers are raku fired stoneware. Make hay while the sun is shining is the running text in this book. It is the mantra of our small farm. Plans, dreams, ideas they all family. The plans in this book at this moment are in various stages of completion. As the old adage states if conditions are right move on it. This book was entirely inspired by the “fire” page. I had a little leftover fiber from a visiting artist and I make large sheets from the leftovers. At the same time my mom sent me dried flowers. My mom works at a church and after all the funerals collects the flowers dries them and sends them to me. I personally detest flowers in my paper, which is why my container to store them in was stuffed and could fit no more. She is my mom I feel obligated to keep them. So I dumped them in this light red paper. When I pulled it out of the drier all I could see was fire, vision and passion. organized chance occurs as a whole consisting of independent elements where there are unlimited possibilities. Studying the Universe and its elements is a profound wonderment. something has happened and will continue to happen. the four elements we rely on have taken millions of years to form by chance. we are at their grace. will we squander our good fortune?